Fine Diamond Estate Jewelry, GIA Certified Diamonds, Watches & Timepieces, Asian Arts, Original Listed Art & Collectibles Auction to include: GIA Certified Diamonds, Gold Jewelry, Diamond Jewelry, Platinum Jewelry, Art Deco Jewelry, Mid-Century Jewelry, Victorian Jewelry, Designer Jewelry, Sterling .925 / .800 / .875 Silver, Timepieces & Watches, Coins, Carved Chinese Jade, Carved Chinese Softstone, Asian & Chinese Arts, Listed Original Art, Florida Highwaymen Paintings, Porcelain, Crystal, Pottery & Textiles. 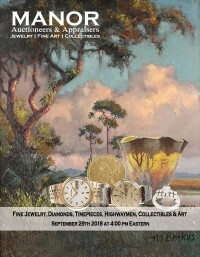 Bid Now on 210 Lots in the September 29th 2018 Sale. 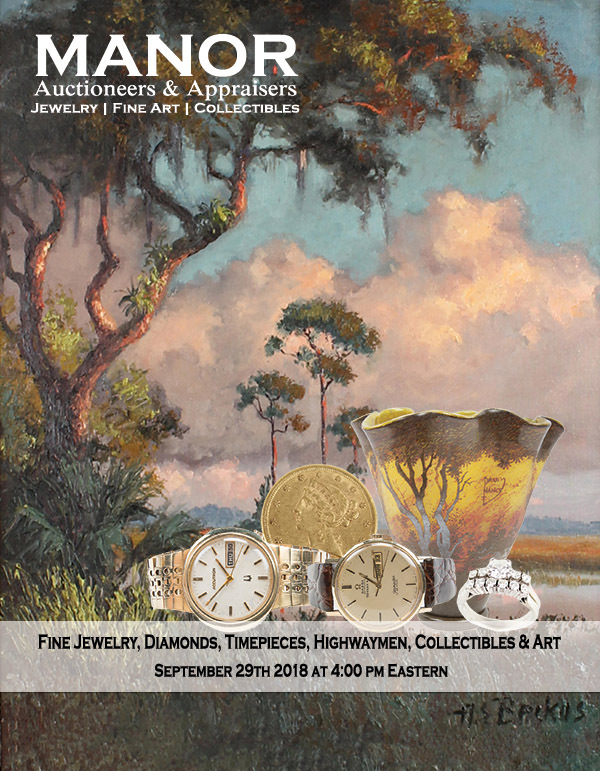 With more than 65 Florida Highwaymen Paintings and 17 of the Original 26 Florida Highwaymen Artists represented - This Sale offers our finest and most exciting Florida Highwaymen Art session to date. In addition to the Highwaymen Paintings, the auction also includes 2 beautiful Albert Backus paintings. Auctions are comprised of consignments from individuals, collections & estates throughout the United States. Please contact us if we can assist you in selling fine jewelry, timepieces, diamonds, silver, statuary, original art, Chinese & Asian arts, collectibles, or specialty collection.